I am very happy to report that Melissa Harris-Perry just held up a copy of the new Perspectives on Politics on her MSNBC show and quoted me (!!) 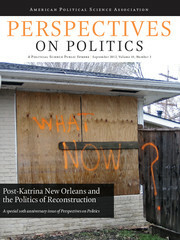 about “Post-Katrina New Orleans and the Politics of Reconstruction,” the theme of our new 10th anniversary issue!! The “play” she gave our journal on the air was greatly appreciated…. I believe that the current issue of Perspectives is the first issue in the history of APSA journals to be a special issue (at 300 pages! ), timed to come out in advance of the annual meetings, to address a major issue linked to the meetings, in this case the site of the conference itself, a major city with huge practical and symbolic importance in American public life. We do the work that we do for the Association and with the goal of continuing to “grow” and improve Perspectives as a journal that is scholarly, engaging, and relevant. And we are happy that this work can play some small role in contributing to the public esteem of our profession and our Association…. Our special 10th anniversary discussion/reception, will take place on Friday, August 31, from 4:15-6:00 pm in Sheraton Rhythm 1. This event is being billed as “Perspectives on New Orleans and the Politics of Reconstruction: A Discussion of Perspectives on Politics with the Editors.” There will be a brief introduction thanking the many people who have contributed to the journal; brief presentations by Edwina Barvosa, Henry Farrell, Elizabeth Markovits and me; and then informal discussion, all in the context of a reception featuring wine, beer, and hors d’oevres, courtesy of APSA and Michael Brintnall. Please come to this event if you can, and please spread the word, and encourage your friends, colleagues, and students to attend.